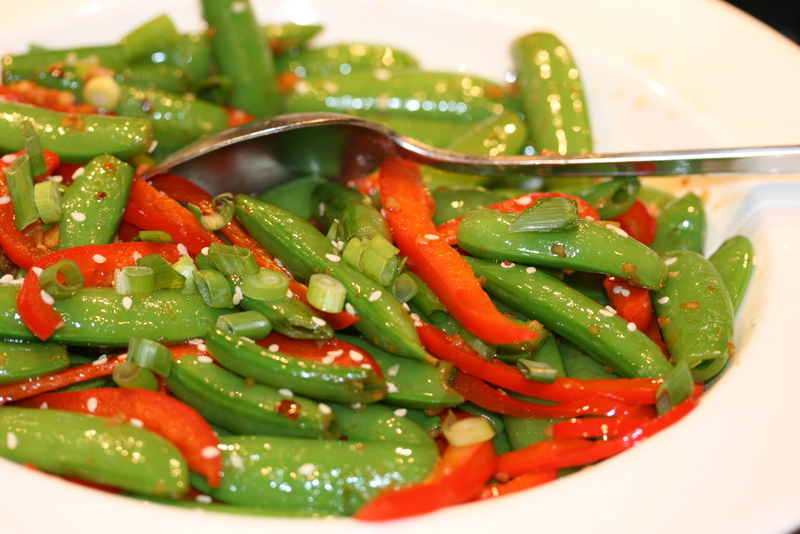 Fresh sugar snap peas matched with sweet red bell peppers, welcome zesty ginger and garlic for a perfect Asian side dish. We love the snap peas to have a crunch. A pinch of red pepper flakes makes for a little surprise heat. Tonight I paired this colorful dish with Jasmine rice and Asian marinated grilled chicken. A pretty addition to your dinner table any night of the week. Heat a medium frypan or small stir-fry pan over medium-high heat. Add the sesame oil and toss in the garlic and ginger. Stir until fragrant, about 30 seconds – you don’t want it to brown, so work quickly. Add the snap peas and peppers, stir-fry for about 3-5 minutes – stirring constantly. Add the soy sauce and pinch of red pepper flakes and stir-fry a minute more. That’s it! You want the snap peas to be crunchy and retain their bright green color. Serve in a pretty bowl with a sprinkle of chopped scallions and some sesame seeds. Enjoy!